Security forces have launched a cordon and search operation in a village in the district following information about the presence of militants there. SRINAGAR: Two Jaish-e-Mohammad militants were killed in an encounter in Kundalan village of south Kashmir's Shopian district on Tuesday while a youth died and over 100 others sustained injuries in security forces firing on protestors near the encounter site. 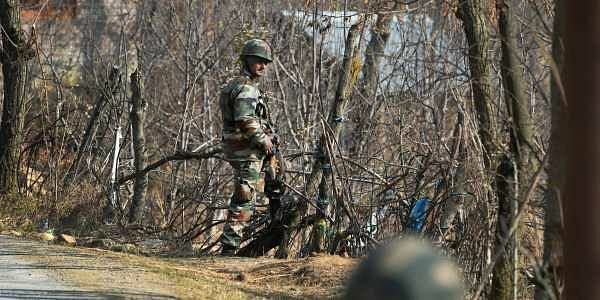 Acting on specific information, police, CRPF and army launched a search operation in Kundalan village of Shopian in the wee hours today While the searches were going on, militants hiding in a house fired on the search party. The fire was returned by troops, triggering an encounter. A police official said some civilians trapped in nearby houses were evacuated by the forces during the gunfight. "The firefight between militants and security forces continued till afternoon during which two Jaish militants were killed," he said. The deceased were identified as Sameer Ahmad Sheikh, a local and Babar from Pakistan. Sameer, a resident of Rawalpora village of Shopian, was a school dropout and had joined Jaish in April this year. As the encounter started, youth of the adjoining areas took to roads and attempted to march towards the encounter site to pave way for militants to escape. They pelted stones on security men after they intercepted them and prevented from moving ahead. The security men fired pellets, tear gas shells and bullets to disperse the crowd. Dozens of youth sustained injuries in the security forces action and were referred to nearby hospital, where from some critically injured were referred to Srinagar hospital for specialised treatment. A doctor in Shopian hospital said about 120 people sustained injuries and were shifted to different hospitals for treatment. One of the critically injured boy identified as Tamsheel Ahmad Khan, 16, succumbed to injuries while being shifted to Srinagar hospital. According to doctors, Tamsheel was hit by bullet in head. Tamsheel was a 9th class student and studying in a local government school. Hundreds of people attended his funeral prayers at his native Vehil village in Shopian in the evening. Thousands of people also attended the funeral prayers of slain Jaish militant Sameer in his native in Shopian village amidst chanting of pro-freedom and anti-India slogans. Class 11th student succumbs to injuries A class 11th student Ubaid Manzoor Lone, who was critically injured in BSF personnel firing on stone pelters during a shutdown in Nadihal area of Rafiabad in north Kashmir's Baramulla district last month, succumbed to injuries in a hospital today. Ubaid had sustained critical bullet injuries on his right thigh in BSF firing on June 25. Militant's father dies of heart attack Mohammad Isaaq Naikoo father of militant Zeenat Isaaq Naikoo R/o Memander village of Shopian suffered a major heart attack this mornir hearing rumours that his militant son was among the militants trapped in encounter in Kundalan village of Shopian. His relatives rushed him to a local hospital, where doctors declared him brought dead. According to doctors, he might have died due to cardiac attack. The separarist leaders Syed Ali Geelani, Mirwaiz Umar Farooq and Mohammad Yasin Malik have called for shutdown tomorrow against the civilian killings by forces in the Valley. Blaming Indian government and forces for killings, they said, "Their approach is haughty and snatching our young and budding souls".